Simple acts of kindness can change lives. One of my goals as a parent is to teach my kids to be kind and to go out into the world and spread kindness. Although we do simple acts of kindness all of the time, each year during the month of January and February we love to invite our community to join us in a special 100 Acts of Kindness Challenge. This year we are once again teaming up with the awesome Megan from Coffee Cups & Crayons to kick off 27 days of kindness! During our challenge this month we are going to help teach our kids to look outward and be kind and DO MORE for others in simple ways. Between January 18th and February 14th we invite you to join us and work together with your kids, students, grandkids, friends, etc. 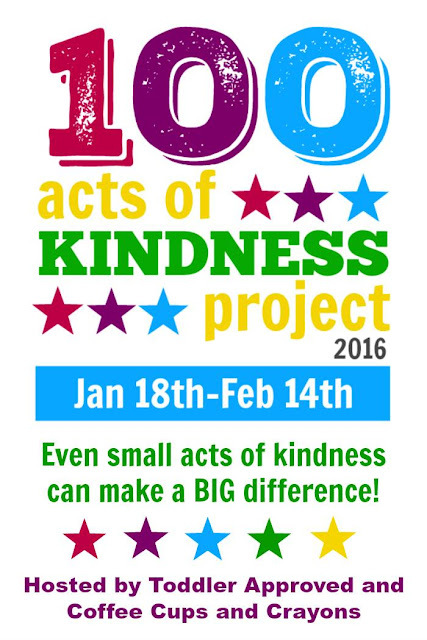 to accomplish 100 Acts of Kindness! Each day we'll share some ideas with you on our blogs to help you accomplish this challenge. You can even join our special 100 Acts of Kindness Challenge Facebook group and get additional ideas each day along with the opportunity to connect with other challenge participants and share what you are doing. Each week we will also issue a special Kindness Challenge for you to try and accomplish that week! 1. Comment and let us know that you plan to join in! 2. Join our 100 Acts of Kindness Challenge Facebook Group. 3. Decide how you are going to keep track of your 100 acts of kindness. This year we created a simple printable chart if you want to print it off and cross off the numbers or stick a sticker in each box each time you do an act of kindness. Watch for it later this week! We'll also share some other ways we've kept track of our acts of kindness later this week. This Wall-o-love one has been one favorite way to keep track of our acts of kindness. 4. Complete each of the 4 weekly Kindness challenges! This heart attack challenge is my favorite from a few years ago. 5. Plan a special kindness celebration on February 14th once you've completed your 100 acts of kindness and come tell us about it! 6. Follow the hashtag #100actsofkindness on Instagram and check out some of the activities we share over there too. I'm @kristinatoddlerapproved and Megan is @coffeeandcrayon. Coffee Cups & Crayons has created an awesome printable 100 Acts of Kindness chart filled with ideas of things you can do to complete your goal. I'm printing this off and sticking up on our fridge! 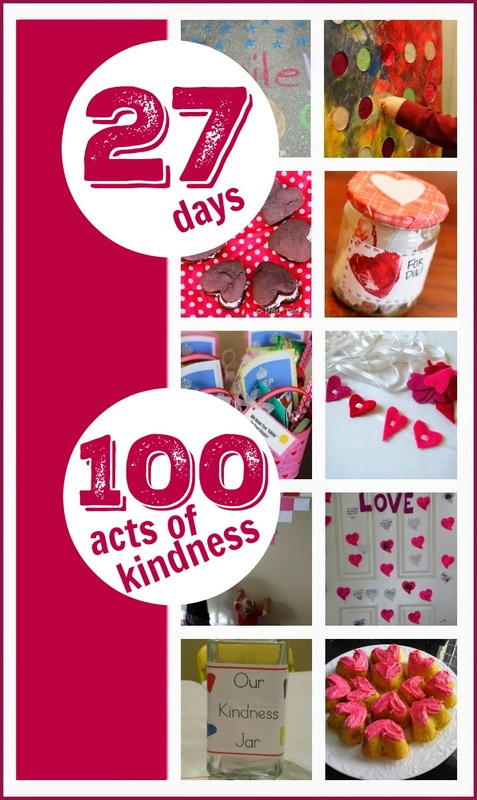 Our 100 Acts of Kindness Pinterest Board is also filled with loads of ideas that you can try. Coffee Cups and Crayons has an amazing resource of kindness activities on her blog! Megan is always coming up with fun ways for her kids to show kindness to others. I am so happy to have her partnering with me again for this challenge this year. I always learn so much from her! I am so excited to kick off this challenge ONE week from today! If you haven't already, join our 100 Acts of Kindness Facebook group and also drop by Coffee Cups and Crayons today to check out the cool free printable Random Acts of Kindness cards that Megan is sharing. Make sure to come back on Monday January 18th for our first Kindness Challenge! We're in! Looking forward to this with my 4 year old! Thank you! Definitely joining in, both with kids at home and at church! Joining! I've been looking for something like this!